By Scott Gilfoid: The WBC has officially ordered World Boxing Council heavyweight champion to face challenger Tyson Fury in a rematch, with a purse split of 60/40 in favor of ‘The Bronze Bomber. There’s a scheduled purse bid for February 5, if the management for the two heavyweights aren’t able to negotiate a fight. 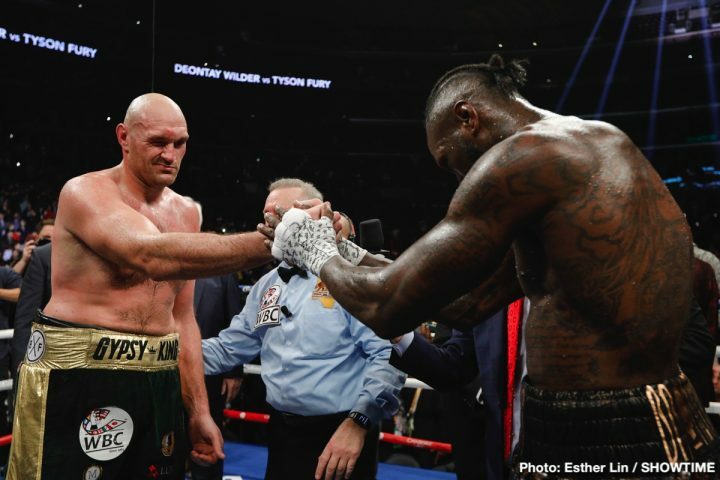 If the Wilder vs. Fury rematch goes to a purse bid, it wouldn’t be surprising to see Matchroom Boxing promoter Eddie Hearn coming up with the winning bid so that he could stage the Wilder-Fury 2 fight on DAZN. If Hearn can’t negotiate a deal for Fury or Wilder to face Joshua, due to his offers being less than what they want, then the next best thing is to put in the winning bi so that he can stage the Wilder-Fury rematch on DAZN, preferably not in the same month Joshua is fighting. The 60/40 split is a great deal for Wilder, giving him the lion’s share of the loot for the rematch against 30-year-old former IBF/IBO/WBA/WBO heavyweight champion Fury. That doesn’t mean that Fury can’t get a better split than that. If he’s willing to walk away from negotiations in order to try and get a 50/50 split, he can do do. Fury, 30, would be better off taking a fight against Anthony Joshua, if he could get the 60/40 purse split that Matchroom Boxing promoter Eddie Hearn was rumored to have offered Tyson last weekend. Unfortunately, the rumor doesn’t appear to be accurate. Even if it was, Fury wants a 50/50 split for the Joshua fight, according to his promoter. Fury doesn’t have to fight Wilder if he doesn’t want to. The WBC ordering the Wilder-Fury rematch means zero. If Fury wants to fight Joshua next, he can do that, because he doesn’t have a WBC title that can be stripped away from him by that sanctioning body. The only thing is, Hearn would obviously insist on Joshua getting the lion’s share of the loot for a fight against Fury, and that would make the Joshua-Fury fight all but impossible to put together. It just comes back down to the business of boxing. If you’ve got a promoter like Hearn that believes his fighter Joshua deserves the bigger money than his opponents, then he’s not going to be able to get the popular heavyweights like Wilder and Fury to agree to the smaller money. Hearn can’t wrestle Fury and Wilder to the ground to force them to accept his offers to fight Joshua. Hearn has to sweeten the deal by giving them what they or close to what they want. Since Wilder and Fury both want a 50-50 deal to fight Joshua, Hearn probably needs to start negotiations with a 55-45 split offer, and then work upwards from there.